Maximillion J. Pegasus is a name fairly familiar with Westerners because of the anime. In Japan the character was named Pegasus J. Crawford (or the pronounced equivalent), but the English version of the manga decided to go with the English version of the name for reasons I could only guess. It's odd considering how the English adaptation of the manga reverts most of the other character names to the original Japanese names. It could very well be that Maximillion J. Pegasus is one of those rare cases where the Western version of the name is just plain better. It doesn't really matter either way because the character is still the same. The same can be said of whether this volume is really volume eight of the previous entries or volume one of a sequel series. It's the same. Pegasus is the creator of the card game Duel Monsters and one day he sends an 8mm tape to Yugi's grandpa's place. The video is essentially a challenge and an invitation to Yugi. Odd as it may sound, Pegasus challenges Yugi to a duel via recording. 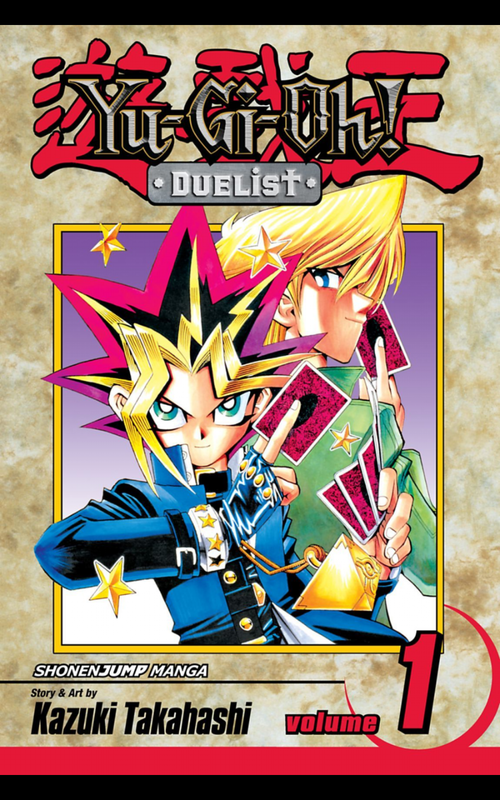 If Yugi loses the duel then he must journey to Duelist Kingdom and take place in the competition that will be held there. Of course, Yami Yugi is quick to step up to the plate once he realizes that the recording of Pegasus is actually just as dangerous as the real thing. Pegasus has the Millenium Eye and he can see the moves his opponents make before they can. Even if it is just a recording, Yugi knows he has a shot at losing the duel. When Yugi inevitably loses the duel the soul of his grandfather is taken and trapped within the 8mm tape. If Yugi wants to free him then he must win at Duelist Kingdom at all costs. 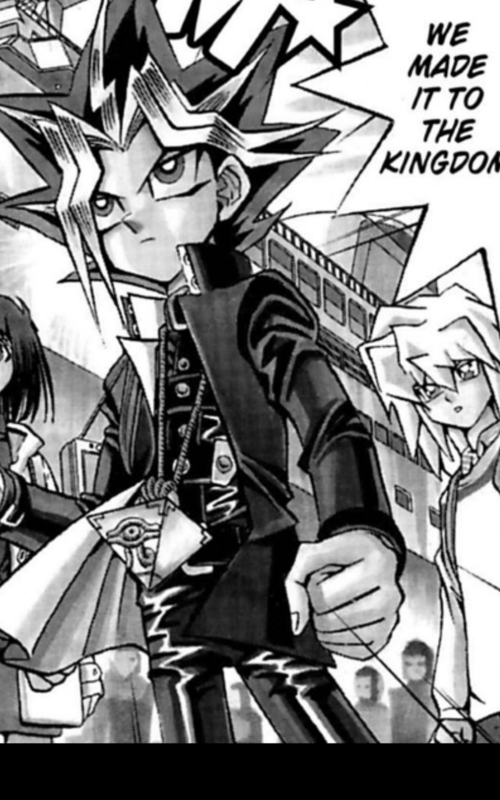 Yugi and his friends (including Bakura) make the journey to the island of Duelist Kingdom, but his powerful deck won't make the journey intact. Thanks to some underhanded tactics by Insector Haga the strongest cards in Yugi's deck get tossed into the sea. Exodia the Forbidden One, the card that beat Kaiba, is gone. Yugi must survive without Exodia and and he vows that his first taste of victory on the island will come at Insector Haga's expense. This is the issue that more or less serves as the beginning of the popular Yu-Gi-Oh! card game we know today. Sure, it's been introduced before in the series, but it was never the primary focus. This time the cards are definitely a huge role. The volume also provides us with a necessary bit on continuity. Outside of some of the storylines involving Shadi, Kaiba, and Bakura there just hasn't been a lot of continuity. By that I mean a sense of urgency needed to turn the page and immediately reach for the next volume once finished. Yu-Gi-Oh! : Duelist gives that tension. It also gives that bit of nostalgia that was lacking in the first volumes. The fact that the focus is now on the cards is both good and bad because I will miss the focus on different games, but this is the bread and butter of the series. Not going to lie about that. Labels: Catalog of Greatness, Manga, Yu-Gi-Oh!